No Conversion, Please: “I believe that there is no such thing as conversion from one faith to another in the accepted sense of the word. It is a highly personal matter for the individual and his God. I may not have any design upon my neighbour as to his faith, which I must honour even as I honour my own. Having reverently studied the scriptures of the world I could no more think of asking a Christian or a Musalman, or a Parsi or a Jew to change his faith than I would think of changing my own.” (as prayed by Mahatma Gandhi in Harijan: September 9, 1935). `Home Sweet Home` remains the evergreen shelter for ages. Why is PM-Modi team setting itself up as a role model? 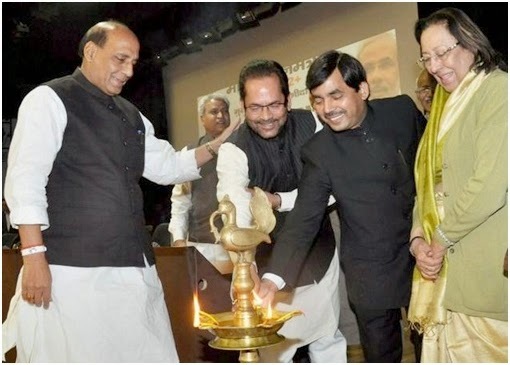 `Ghar Wapsi` must begin with first converting and swapping the BJP Muslim ministers in their own home? This is a classic divisions of people and an example of clever governance. Poor Muslims are pitted against the rich. Rich Muslims as shown in the image are spared by Modi Team. Need for a home motivated our ancestors to keep the `development batteries` charged. From the early stone age- `caveman` to today’s `spaceman`, we all cherish the role of home. Even the Indian workers overseas try to negotiate advance in salary or loans to buy toys and chocolates for children back home. The buzz word is Home Coming is a celebration for better living for all. The better and more skilful the Indian or the Global citizens the more share he/she is likely to get. Where are Aache Din for `Hindu` workers PM-Modi ? Religion alone cannot motivate followers to get better jobs and profit. Collective motivation is a very personal process and must come from the individual jobs and individual skills based on peer pressure, good governance and use of modern minds. Home coming with proper jobs for poor and with unequal wealth distribution is unfair. Unequal rules and double standards will be difficult to withdraw. Let us see how ? A sad struggling `Hindu` house painter in UP tells me why he should not get Rs.5 lac reward while a Muslim painter can easily get by getting converted to become a Hindu. Sample a Muslim Taxi driver from Dehradun who wants to settle and shift in Delhi for better opportunity says Rs.5 Lac deal is nothing and shall not fetch him a home or help buy a room in Delhi. A Parsi Indian writer Bachi Karkaria in her satire that appeared recently in Times of India demands why Parsi and others are left out in this `paid deal` of conversions. Paid jobs helps people get out of hopelessness with an opportunity. A minority commission team as per Times of India who visited Madu Nagar slum in Agra where 57 Muslim families are converted in Dec-2014 to Hindus puts the event as cheating the poor by false petty promises of BPL cards and Ration cards. Instead of fighting poverty as pre-election promise, Modi team is now fighting for conversions by using bribes. Schools for all by 2015 as `internationally committed` by several world leaders including our Hon.PM his team wants children to attend school on Christmas Day and write an essay on Good Governance Day. When you wish to stop the children (of all religions) enjoying the Christmas Holiday and find Santa Claus in the street or on Television distributing happiness and gifts to children then how can you motive a young mind to write essay on Good Governance day on 25th. Dec.-2014. BJP appears committed to using bribes to lure conversions rather than fighting for jobs, providing schools for all and removing poverty. A home builds security and hope and never loses its value. Security ensures a peaceful, dignified environment to survive, to work and contribute. Survival, growth and the legacy of tradition cannot be understood without sharing. Sharing, Home Coming or getting connected by social media cannot be freely understood, unless seen together as a natural part of the common tradition with a respectable job or an opportunity for human survival. Indians need to celebrate an honest Home Coming. Modi team should immediately stop their `Ghar Wapse`-Home coming Programme for the betterment of all. About Author : Has worked in India and several countries as Director Executive and is now monitoring the historical people movement for a Swaraj.